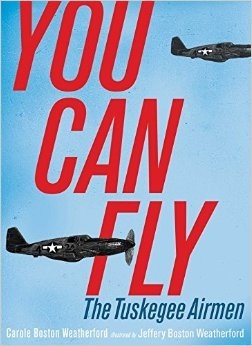 You Can Fly: The Tuskegee Airmen follows the training, trials and triumphs of the U.S. military’s first African American pilots. Set during World War II, the book pairs my scratchboard illustrations with poems by my mother, award-winning author Carole Boston Weatherford. The title is our first collaboration and my publication debut. This year marks the 75th anniversary of the Tuskegee Airmen. I first heard about the Tuskegee Airmen when I was a young boy. Perhaps it was during a visit to the Smithsonian Air and Space Museum in Washington. Later, I saw an exhibit about the airmen during a family vacation to Tuskegee, Institute Alabama. I brought to this project a lifetime fascination with flight. I have always had dreams where I was flying like a bird. On my first airplane ride at age four or five, I had a window seat. As the plane sped down the runway and lifted its nose from the ground, I said, “We’re blasting off!” I doodled my way through elementary and middle school, creating drawings of aircraft and weapons in my notebooks. I also played scores of video games featuring aircraft in futuristic, intergalactic battles. For inspiration and historical accuracy, I researched documentary photographs from the Library of Congress, National Archives and military museums. I also watched the movie Red Tails. In some cases, I created digital collages as studies for my sketches. While researching picture references, I had some dreams of meeting Tuskegee Airmen. After I found picture references and chose the subject matter of a piece, I drew a graphite study to layout the composition. Once that was completed and approved by the publisher, I refined the image and transferred it to scratchboard. I used various nibs for different effects. 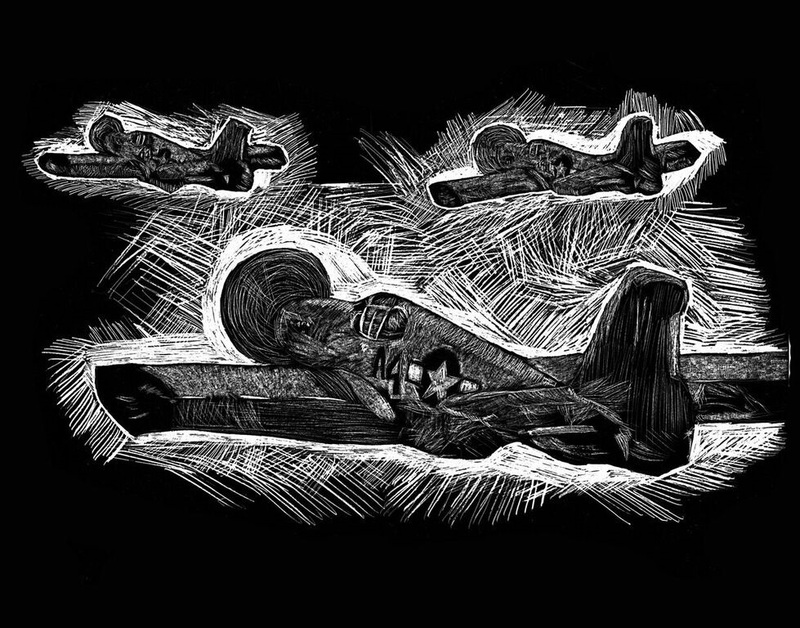 I believe that scratchboard creates a graphic novel feel. These illustrations reflect my gratitude for the veterans in my family. My great great great grandfather fought in the U.S. Colored Troops during the Civil War. My great grandfather was a mule skinner in the Army and my grandfather served in the Army in World War II. I’d like to think that my ancestors would be proud. Like my mother, I am also a poet, although I lean more toward rap and spoken word. My two favorite poems in You Can Fly are “Head to the Sky,” which opens the book, and “Fight Song,” which was the actual fight song of the 99th Fighter Squadron. I hope that young readers will embrace the book’s central message–YOU CAN FLY. Likewise, I hope that parents and teachers will convey high expectations to propel children’s dreams. Here is some art from the book. Enjoy! Jeffery Boston Weatherford is a multitalented artist, designer and poet. The son of a poet and a preacher, he was born in High Point, North Carolina with hands so large that his grandmother predicted that he would one day do important work. That turned out to be art. He earned a B.A. in Art and Design from Winston-Salem State University, where he was a Chancellor’s Scholar. 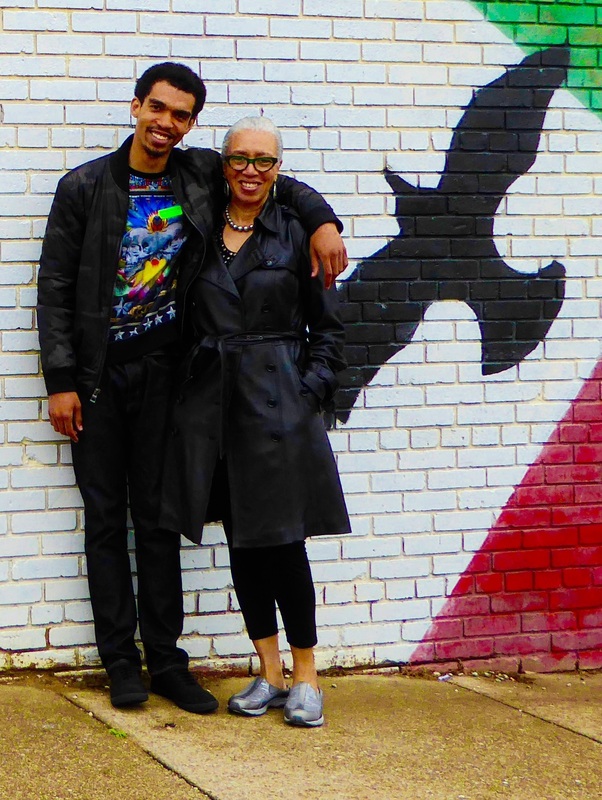 He holds a Master of Fine Arts degree from Howard University where he received the Romare Bearden Scholarship and received a presidential send-off from commencement speaker Barack Obama. 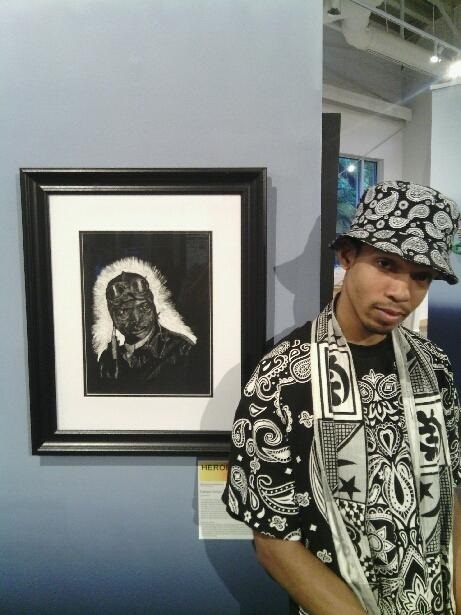 Jeffery’s work has shown at galleries in the Southeast and Mid-Atlantic regions. Scratchboard is definitely an art which has so many moods – it was a great choice for this book, and what a neat project for mother and son! Congratulations to the artist, and we can’t wait to see what’s next from him. I agree.This is amazing artwork and a wonderful story to tell. Ican definitely see myself using this in a classroom to teach children to be pioneers. I love this.